This is a 90mm horse standing in a relaxed natural pose with no furniture on it. 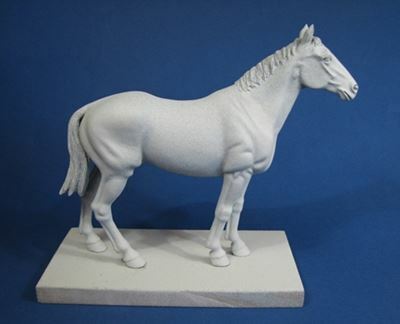 The master for this horse was sculpted by the talented David F Grieves and is sold as a free standing, unfurnished, 90 mm horse that fits with many of the Post Militair and DF Grieve 90mm figures. The kit consists of 4 resin parts two body halves, a head and a tail. This kit is 90mm in scale and is supplied unpainted, the kit requires assembly and is not suitable for children under the age of 12. Any groundwork shown was provided by the artist and is not included within the kit. Hawk Miniatures presents a 1/12th Scale bust of a Sergeant of the 15th Kings Hussars. Hawk Miniatures presents a 150mm Scale figure of a Sergeant of the 15th Kings Hussars.